DON'T YOU JUST LOVE KITS? They have everything you need to get going (growing). Step-by-step instructions written by good 'ole Americans! (No translation necessary)... If you can read, you can succeed! Superb customer service backs you up every step of the way- (But these kits are so user-friendly, chances are you won't even need us). 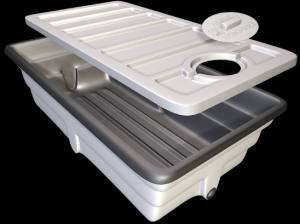 Been hesitating about getting started in hydroponics because of all the equipment choices and decisions to make? Resist no longer! In keeping with our philosophy of "keeping it simple", we have done all the legwork for you. We've chosen six outstanding (yet reasonably priced) hydroponic systems in kit form: [Sorry, but kits ship to U.S. only]. 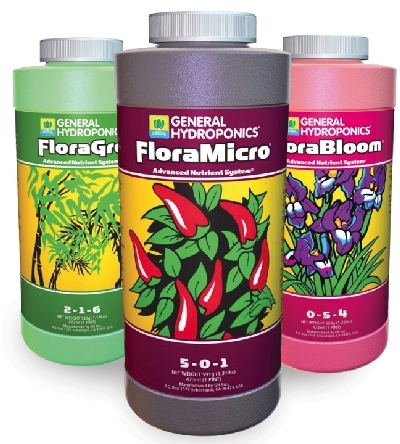 Ebb & flow systems are hydroponics at it's classic best; the "workhorses" of the hydroponics industry. Simple, reliable and prolific, they provide periodic flooding of the plant roots with nutrient solution, followed by draining back into a reservoir for re-use. Hence the name "Ebb & Flow" or "Flood & Drain". The Megagarden is compact but prolific. 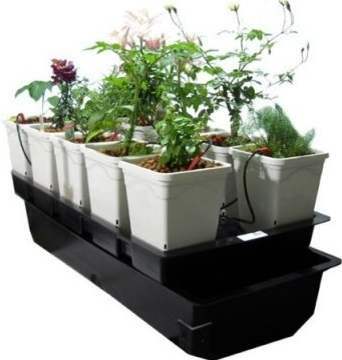 The HydroTek systems are for large specimen plants if you have room to spread out a little, or for a closet setup. 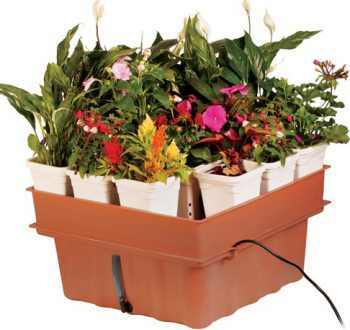 Enjoy the classic Ebb & Flow System in a 22" x 22" x 10" size garden. Ebb & Flow Systems work by pumping nutrient solution up from a reservoir to a controlled water level tray. All plants are watered uniformly on a timed cycle before draining back into the nutrient vat. The VersaGrow system offers the perfect blend of performance and simplicity at a very competitive price. It provides "good bones" for a super-productive system. 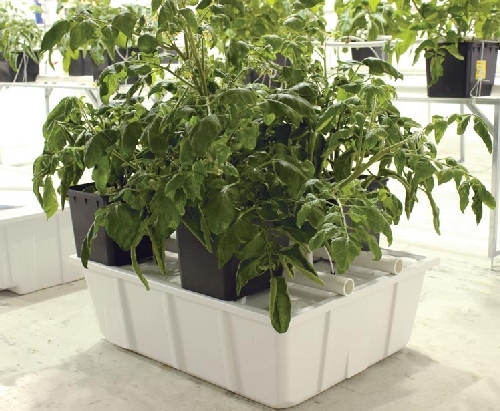 You supply the desired media and growth method (Adaptable to Aeroponic, Drip, or Ebb and Flow; compatible with any medium). The VersaGrow comes in a space-saving, compact design (52’’L x 24’’W x 19’’H), with fast and easy assembly. Easy access to the large tank to monitor nutrient solution. Excellent drainage and flow with any method used. 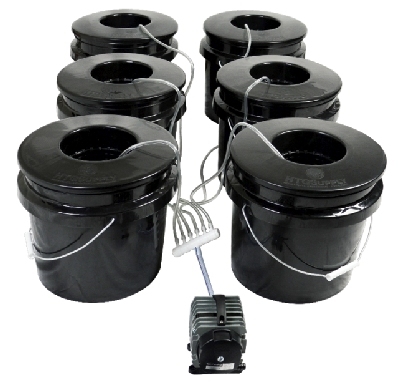 The perfect top drip system with classic Bato buckets. 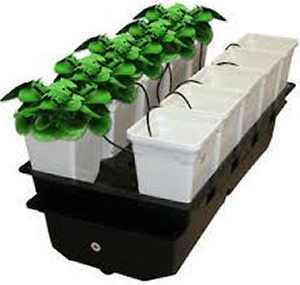 The EuroGrower is a great hydroponic kit for someone new to this fascinating gardening method. Although simple to assemble and maintain, The Eurogrower is a serious, sturdy basic system to get your grow room off to a great start. 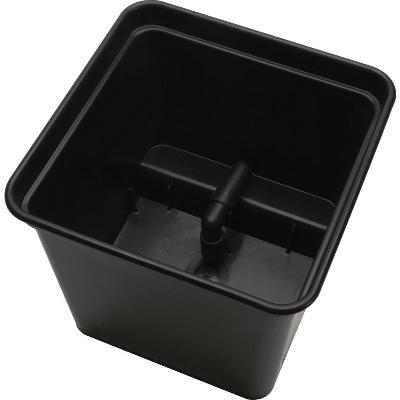 The heart of the EuroGrower is a smartly designed 40 gallon Panda reservoir, which is more than adequate for its eight 2 gallon buckets. Contact us for details and specs, shipping costs and how to buy this top quality FarmTek system at the lowest possible price . The Aeroflo 18 System mists the plant roots 24/7 with aerosolized nutrient-rich solution. This promotes an incredible root system, super-charged growth and maximum production. Aeroponics systems utilize a continuous, 24/7 micro-misting of the plant roots with highly oxygenated aerosolized Nutrient Solution. 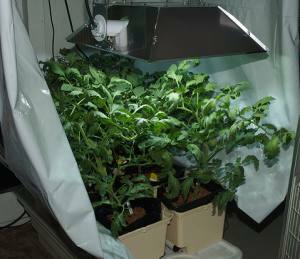 This hydroponics method promotes amazingly rapid and robust plant growth (probably the most prolific system available today). 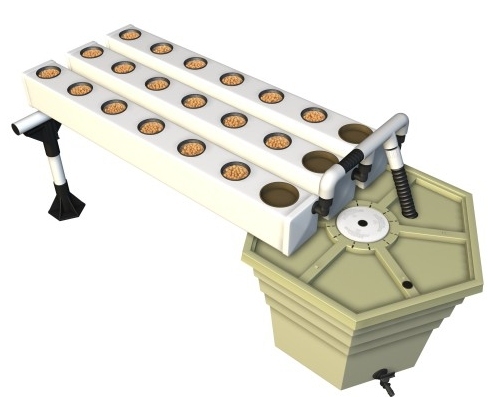 Would you like this super-charged Aeroponic 18 unit in your grow room? FarmTek Aeroponic tube systems deliver optimum oxygen levels and nutrient-rich mist directly to the root zone. 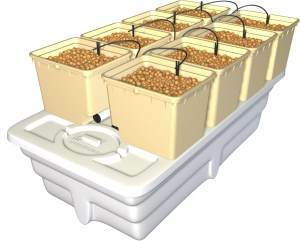 Ideal for rapid and prolific plant growth from a small footprint unit! Each Hydrocycle Vertical Aeroponics system includes pump, ceramic air diffusers, tube hangers, all the necessary plumbing and fittings. 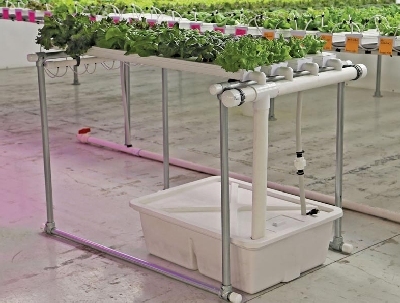 This NFT system produces lush, clean, healthy lettuces and greens year-round. Earn extra income or just feed your family. This compact system is affordable and easy to operate. Tight on space? 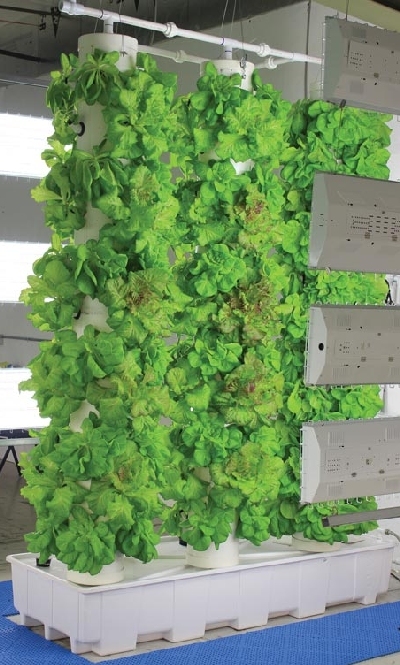 The FarmTek Hydrocycle NFT Lettuce System above is 39" x 60" x 38" high, yet grows 28 heads of lettuce in only 6 weeks (stagger seed starts for continuous production). 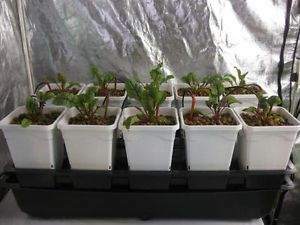 Disclaimer: This kit can be used for any vegetables, herbs and ornamentals that can be cultivated in a hydroponic system. It is not intended for use for any plants which are illegal in your locale. 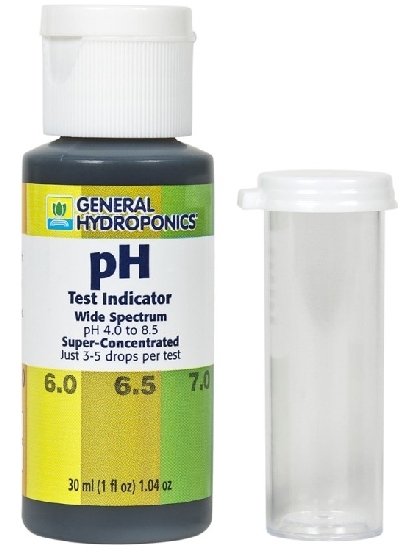 The owners and editor of this website, Hydroponics-Simplified.com, strongly advise you not to break the law, and do not accept liability for any actions you might take after reading our information, warning and disclaimer. 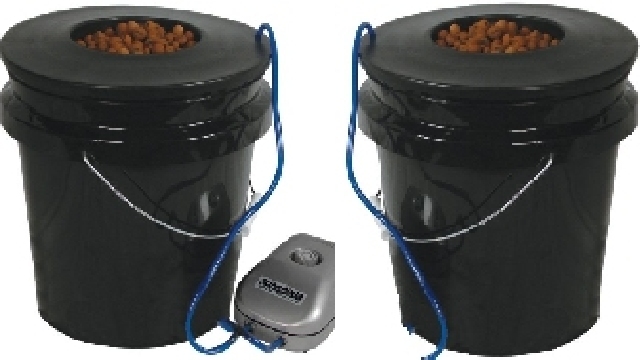 the Bubble Brothers 6-Pot Deep Water Culture Hydroponic System is proven to grow faster and produce larger plants than soil. with the Bubble Brothers. 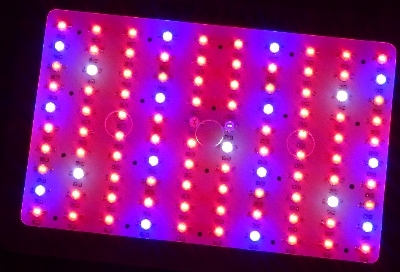 This clever system integrates the age old technique of DWC, Deep Water Culture, with modern advancements. 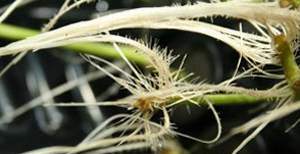 One of it's best features is the new Rhizo-Core hub in the plant baskets, which allows optimum contact between roots and super-oxygenated nutrient solution. This system also sports a massive 951 GPH commercial air pump and big beefy 2" air stones which are heavy enough to stay submerged at the bottom.